Biokleen Chain & Parts Lube SL-100 (available here in Large Sizes) AKA "Soy-Lube", is a Natural, effective, non-aerosol lubricant that's safe for you and the earth. Chain & Parts Lube SL-100's bio-based formula is made entirely from renewable resources for an effective lubricant that lasts longer and is non-hazardous. It can be purchased in small 4 oz 12 packs with a manual pump-spray top, or it can be purchased in bulk cost savings sizes, and then be used to refill the 4 oz pump, or added to a solvent resistant pump sprayer for higher volume applications. SEALS and dries out moisture. Use SL-100 in place of WD-40, and many other lubricants. 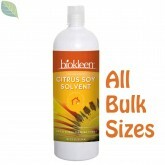 Use our Bulk Versions to economically refill the 4 oz version of the Biokleen Soy Lube Pump at a Huge cost savings. Great for Household Garages, Mechanics, in-house building maintenance staff, Industrial Applications & more! Hello Biokleen Chain & Parts Lube... Bye-bye squeaky 'stuff' and stinky 'air'!